Flower boxes can make a home look more inviting and beautiful. Flowers add splashes of color and improve a home's curb appeal. There are plenty of plants to choose from that will do well in flower boxes. Choose the types and colors to complement the style of your home. Considered one of the most popular flowering annual plants, petunias are easy to grow and bloom all summer. They come in a variety of colors such as pink, purple or white. Petunias come in two types--grandifloras and multifloras. Grandifloras have large blooms consisting of single- and double-flowering forms. Single-flowering grandifloras produce blooms measuring up to 5 inches across; some varieties have ruffled or fringed petals. They have trailing habits that make them ideal for hanging baskets or window boxes. Best suited for containers, double grandifloras produce double, fringed petals. Multiflora petunias are smaller and produce more flowers than the grandifloras. Similar to grandifloras, multifloras also produce single- and double-flowering varieties, which are more compact and resistant to wet weather than the grandifloras. Single multifloras are excellent in mass plantings in flower beds. Double multifloras are most suitable for containers. Modern multiflora petunias, also known as floribundas, possess slightly larger flowers and are more compact than older multiflora varieties. Modern multifloras include the Madness, Carpet, Polo and Celebrity series. Petunias perform best in a sunny location and a moderately fertile, well-drained soil. Feeding with a complete fertilizer, such as a 5-10-5, into the soil each spring helps maintain the soil's fertility. Buy compact, stocky petunias instead of tall, spindly types because they recover from transplanting faster. Place plants in a shady, protected area initially and then gradually expose them to direct sun. Bring them indoors at night during freezing temperatures. Geraniums produce florets that are single, semi-double or double. The cluster of florets may come as solid one color or bicolor. Colors include bright red, scarlet, orange-salmon, coral, soft pink, hot pink, pure white and lavender to name a few. Geraniums are warm-weather plants, although they can survive a light frost. They need full sun to grow and flower well--at least six or more hours of direct sunlight daily. Placing geraniums in a semi-shade location is ideal in areas with excessive heat (over 90 degrees F). They prefer a fairly rich, well-drained soil for planting. Fertilize geraniums every two weeks or at least once a month using a balanced, water-soluble, 10-10-10 or 20-20-20 fertilizer. 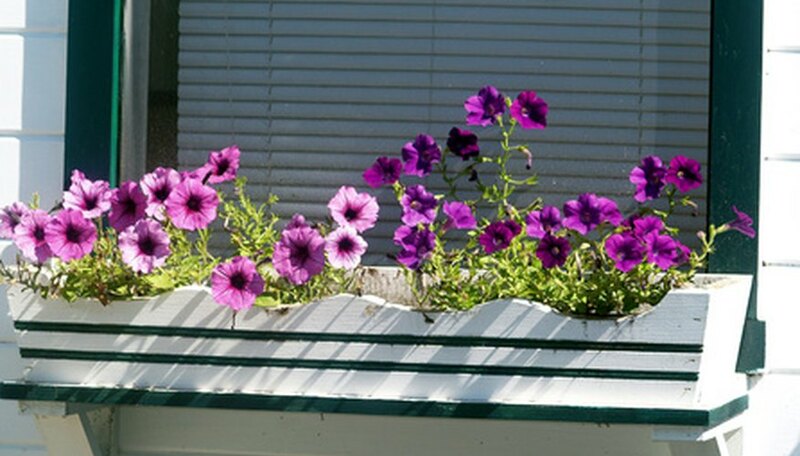 Use ivy geraniums in window boxes to add a vibrant touch of color that will last all season. Pansy plants are biennials that grow well in sunny or partially sunny locations. They can survive light freezes or a little snow. Often planted in fall, pansies can bloom over the winter in warmer climates where they can also re-seed themselves and come back the next year. Pansies need six hours or more of sunlight and thorough watering about once a week. For maximum bloom, use plant food about every other week. Clear-faced and monkey-faced are the two varieties of pansies. The monkey-faced variety has a dark blotch in the middle of the face, while the clear-faced has none. Pansies are available in yellow, brown, blue, red, white, maroon and orange colors.